This volume of Current Topics in Membranes focuses on Membrane Protein Crystallization, beginning with a review of past successes and general trends, then further discussing challenges of mebranes protein crystallization, cell free production of membrane proteins and novel lipids for membrane protein crystallization. This publication also includes tools to enchance membrane protein crystallization, technique advancements, and crystallization strategies used for photosystem I and its complexes, establishing Membrane Protein Crystallization as a needed, practical reference for researchers. 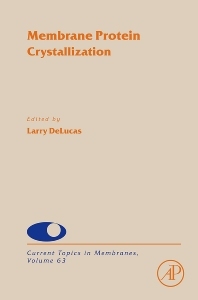 Membrane Protein Crystallization, a volume of the established Current Topics in Membranes serial. This volume is edited by Dr. Larry DeLucas, University of Alabama at Birmingham.